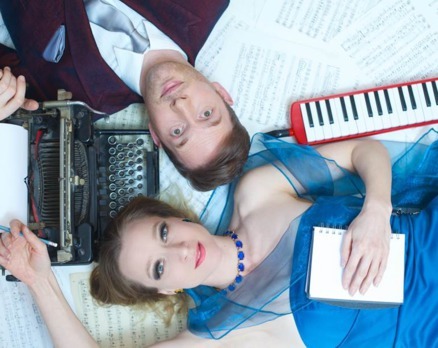 Sarah-Louise Young (Fascinating Aida, The Showstoppers) and Michael Roulston (Black Cat Cabaret, Crazy Coqs Open Mic resident pianist) return to Crazy Coqs with their original comedic musical piece Two Faced. The pair are regular fixtures at the Edinburgh Fringe and have toured internationally with another joint show Julie Madly Deeply, which also transferred to the West End. These two, each very talented and well known in their own right, make a particularly successful duo. With their easy rapport, gently poking fun at one another and clever lyrics, they have created an interesting and entertaining show comprising totally of their own work, looking at the banalities of modern life and juxtaposing them with modern-day obsessions such as aging, social media and toy boys. The item I found funniest, and certainly related best to, was Please Don’t Hand Me Your Baby. With its twist of intention, taking the listener down one path and then exposing a lacerating truth, this song is both witty and refreshing. There is also the welcome inclusion of comic character Bernie St Clair – an American diva of a certain age. Inevitably, some songs work better than others, but for my money, the best of them added an edge of poignancy. There were only two ballads, and both stood out, not only because they were different from the comedic work, but because they displayed a maturity both musically and in subject-matter. The Letter again led the listener in one direction, and then surprised with a bitter yet sad twist, whereas Over You revealed depths in Young as a performer the rest of the programme hides. I would like to see more of that sort of revelation of their real selves, moving us without losing any of the humour and winning charm. As they develop their work, I am hoping they might show a touch more bravery in this regard. It is encouraging to see original material presented well in an artform often saturated with cover songs, and long may it continue. This work was first workshopped in St James Studio last year and has undergone some alterations. Further tweeks were made just before the show began the night I saw it. I am interested to see how life, especially now Young is about to turn 40, will shape the direction of their future writing. This entry was posted in Cabaret Reviews and tagged fiona jane weston, Michael Roulston, Sarah Louise Young, The Crazy coqs, Two Faced. Bookmark the permalink.